When it comes to delivering a film quick and on time, UTV Motion Pictures holds a near perfect record – their recent Naan Sigappu Manithan is a good example. Currently they are also co-producing Anjaan with Thirrupathi Brothers and the film is almost done with just a week’s shooting left. From the look of it, the film as planned, will release in August. Updating about the progress, Dhananjayan, UTV Motion Pictures’ South Chief announced, “Team #Anjaan moved to Mumbai & shooting some patchwork scenes. Film gets over this week & director Lingusamy will be free to bring out teaser". About the release of the teaser, he said that the date hasn’t been locked yet. Anjaan stars Suriya and Samantha in the lead and Santosh Sivan is helming the camera. Yuvan Shankar Raja’s music is expected to release soon. What's Special With The Anjaan Photo Released Today? The Overseas Rights Of Suriya's Anjaan Has Been Sold. Suriya's Anjaan On The Lines Of Kaakha Kaakha, Ghajini, Ayan And Singam! 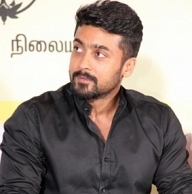 Suriya's Anjaan Plans Its Final Leg Of Shooting. Trisha Has Said No To Both Suriya And Shahrukh Khan? People looking for online information on Anjaan, Anjaan teaser, Lingusamy, Samantha, Suriya will find this news story useful.